It is always a sad day when someone you know dies, and to be there when it happens is devastating. Ask me, I know. In this world of ours called blogland we get to ‘meet’ some interesting people along the way. Some we just pop in once in a while to say “hi” or to see how they are doing, and others we visit every day. I have been following Recipes by the Haggis and the Herring for over a year now, but only as an observer. In October last year I awarded them the versatile blogger award and if you have not yet read their blog, head on over and see the amazing array of recipes on offer. Sadly, Meredith shared with us her sad news that Daniel had passed away, surrounded by his family. She ends her tribute to him by saying: Anee L’Dohdee V’Dohdee Lee (אני לדודי ודודי לי | I am my beloved’s and my beloved is mine). As a tribute to Dan, the members of The Secret Recipe Club are posting today – to remember, to create a new memory, to hold some light out for Meredith, her two children, and for the baby yet to be born. May G-d hold you forever in the palms of His hand, and show you the everlasting gift of peace. 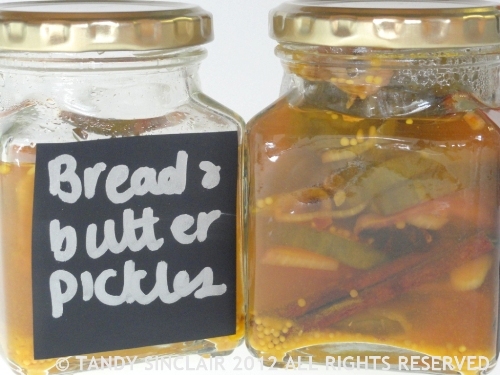 When choosing my recipe I went for bread and butter pickles. Bread and butter is the term one uses for so many things – the everyday income earned, the staple food on the table, and for me, it means the ordinary. At a wedding I went to the Priest offered the following words to the newly wed couple “I wish you many ordinary days”. It sounds like a strange wish, but it is the ordinary days that are most common, and with love, we can endure them. Meredith, I hope you had many ordinary days and even though they were too short by far, may the memories you made during them be the ones that keep the love alight. What does bread and butter mean to you? God bless Daniel soul may he be in heaven… I loved your tribute to him, you choose the essential food bread with the most delicious one butter to commemorate Daniels’ travel (this is the way I like to think about these kinds of separation)… My prayers are for Meredith and all his family during this difficult time. Absolutely beautiful tribute. I’m so proud to be part of the SRC community. Gosh Tandy I am so sorry for Meredith’s loss. I wish her a peace that surpasses all understanding. I am sorry too that you have lost a friend. It’s always not easy to write a post for remembering a friend passed away. I like the idea to pay tribute with and ‘ordinary’ ingredient like butter or bread. Lovely, spicy picckles! Thank you Rita, it was a difficult week of sad posts! Bread and butter. Last year I visited friends who have a farm. Homemade bread and their butter. I regret to say I laid the butter on THICK and loved every scrap. Odd because I seldom have butter on bread these days. A lovely tribute and beautiful post. Beautiful post Tandy – bread and butter, the staff of life, the stuff of everyday. Lovely thoughtful post, Tandy.I’m so sad for your friend. I love your thoughts on “ordinary days.” I hope that Meredith finds comfort in the love and support of all her friends. Great choice and moving tribute. I love the quote about ordinary days – so true. Look awesome nice tribute I loved Daniel recipes! It is very sad Hope! Your post reminds us that days that don’t seem eventful–where we have the people we hold dear in our lives–they are a gift. My thoughts are with Meredith during this difficult time. I’d love some of those pickles on a smoked meat sandwich for lunch . . .
Hi Tandy, what a beautiful post, so gently written with such well chosen soft words. Bread and butter is as you say the ordinary, and the sustaining.